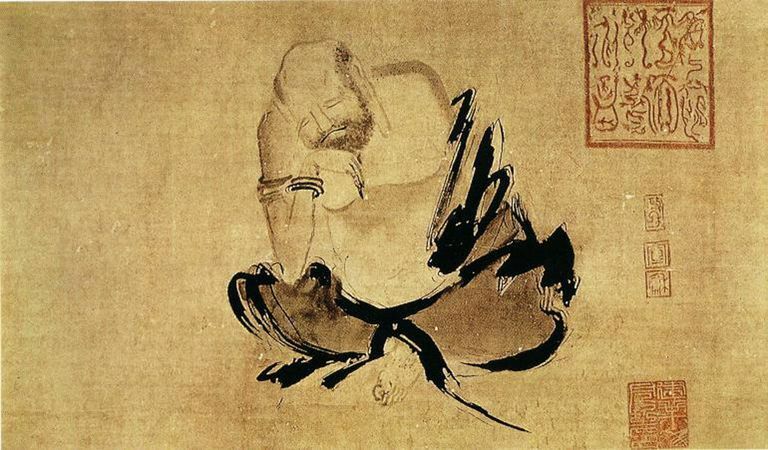 Dazu Huike (487-593; also spelled Hui-k'o, or Taiso Eka in Japan) is remembered as the Second Patriarch of Zen and the principal dharma heir of the legendary Bodhidharma. If you have heard of Huike at all, it's probably through the famous story of his first meeting with Bodhidharma. The legend says Huike found Bodhidharma meditating in his cave and patiently kept a vigil outside waiting for the elusive old sage to invite him in. Days passed; snow fell. Finally a desperate Huike cut off his left forearm as a demonstration of his earnestness, or perhaps just to get Bodhidharma's attention. Then came the famous exchange: "Your disciple's mind has no peace as yet," Huike said. "Master, please, put it to rest." Bodhidharma said, "Bring me your mind, and I will put it to rest." Huike said, "I have searched for my mind, but I cannot find it." Bodhidharma said, "I have completely put it to rest for you." Thanks largely to a biographer named Daoxuan (596-667; also spelled Tao-hsuan), we have a more detailed story about Huike's life than we do about many other figures of early Zen history. Huike was born into a family of Taoist scholars in what is now Henan Province, China, about 60 miles east of Luoyang and a bit north of the sacred mountain of Songshan. As a young man Huike also studied Confucianism along with Taoism. The deaths of his parents caused Huike to turn to Buddhism. In 519, when he was 32 years old, he became a Buddhist monk in a temple near Luoyang. About eight years later, he left in search of Bodhidharma, and he found the First Patriarch in his cave in Songshan, near the Shaolin Monastery. At the time of this meeting, Huike was about 40 years old. Read More: What Do Buddhists Mean by Lineage? Bodhidharma also gave Huike a copy of the Lankavatara Sutra, which Huike is said to have studied diligently for the next few years. The Lankavatara is a Mahayana sutra chiefly known for its teaching of Yogacara and Buddha-Nature. Huike may have remained in Shaolin for a time. According to some accounts he served as abbot of the legendary temple. But at some point Huike, who had lived his whole life among scholars and monks, left Shaolin and became an itinerant laborer. This was to tranquilize his mind and learn humility, he said. And then, eventually, he began to teach. The dharma transmission from Bodhidharma to Huike would have taken place in about 534. In that year, the Northern Wei Dynasty that had ruled northern China collapsed under the weight of riots and revolts, and northern China was split into two kingdoms. The ruler of the eastern kingdom established his capital in Ye, which is near the modern-day city of Anyang in northern Henan Province. It's not clear when, but at some time Huike taught Zen in Ye. He attracted many students, but he also angered the Ye Buddhist establishment. According to biographer Daoxuan, it was during his time at Ye that Huike actually lost his left forearm. The limb was severed possibly by bandits, or possibly by the followers of rival teachers. The political situation in northern China remained volatile; new dynasties seized power and soon met violent ends. From 557 to 581, much of northern China was ruled by the Northern Zhou Dynasty. The Northern Zhou Emperor Wu was persuaded that Buddhism had become too powerful, and in 574 and 577 he attempted to abolish Buddhism in his kingdom. Huike fled south. Huike found a hiding place in the mountains of southern Anhui Province, near the Yangtze River. It is unclear exactly how long he stayed there. According to author and translator Bill Porter (in his book Zen Baggage [Counterpoint, 2009]), today on a mountain named Ssukungshan there is stone platform on which (it is said) Huike lectured, and a boulder that (it is said) marks the place where Huike passed Bodhidharma's robe and bowl to his successor, Sengcan (also spelled Seng-ts’an). In time, a very elderly Huike returned to north China. He told his students he had to repay a karmic debt. One day in 593 a famous priest named Pien-ho accused Huike of heresy, and magistrates had the old man executed. He was 106 years old. "You have truly comprehended the Dharma as it is; the deepest truth lies in the principle of identity. It is due to one's ignorance that the mani-jewel is taken for a piece of brick, but when one is suddenly awakened to self-enlightenment it is realized that one is in possession of the real jewel. The ignorant and the enlightened are of one essence, they are not really to be separated. We should know that all things are such as they are. Those who entertain a dualistic view of the world are to be pitied, and I write this letter for them. 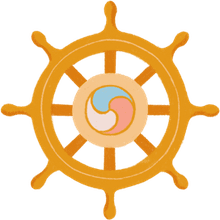 When we know that between this body and the Buddha, there is nothing to separate one from the other, what is the use of seeking after Nirvana [as something external to ourselves]?" Samurai Zen: Was it Really a Thing? Zen and Martial Arts - What's the Connection? What Is Zen Buddhism Really About? 'If You Meet the Buddha, Kill Him' -- What Does That Mean?